Groz-Beckert Knitting division will demonstrate how products from the Groz-Beckert portfolio work together with the highest precision using a large circular knitting machine made from acrylic glass at the ITMA ASIA + CITME 2014 that will be taking place from 16-20 June 2014 in Shanghai. According to Groz-Beckert, its glass machine is a real eye-catcher that will help the company to provide some insights into the perfectly coordinated interplay of needles, system parts and cylinder. The large circular knitting machine made from acrylic glass and built true to scale will demonstrate the areas in which Groz-Beckert products are used, and how the individual components all mesh together with the highest precision. The exhibit, subdivided into different segments, presents a total of 14 different knitting technologies, including not only body size, single jersey and double jersey but also jacquard techniques and several others. The unique design of the cylinder represents a sequence of different gauges, from E10 to E50. Although the Groz-Beckert components appear to be floating in mid-air, they really are genuine parts that can be detached and moved, the company reports. Improving productivity in the circular knitting process is a further key topic. Every visitor to the trade show will be able to have Groz-Beckert calculate their individual potential in terms of productivity and resources savings. Attendees can also discover how to make maximum use of untapped opportunities for improvement, by using custom-fit Groz-Beckert products. The company has developed this application under the slogan Fine-tune your productivity. 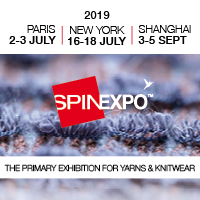 It is aimed to demonstrate just how great the positive effects can be of making numerous small changes to the five key factors of the knitting process: engine speed, efficiency, needle breakage rate, needle service life, and energy consumption.